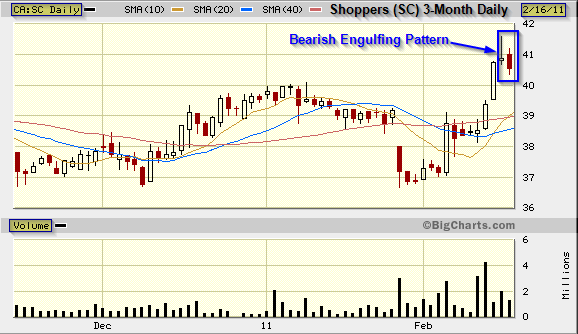 Shoppers Drug Mart could not break $41. Your online trading success does not depend on your predictions for the market: your success depends on your online trades in reaction to market signals. Updated article on Shoppers published in the National Post on March 30, 2011: Expanded Shoppers Drug services could help earnings, analyst says. Please reference three previous posts on Shoppers Drug Mart. This entry was posted in Stocks and tagged bearish engulfing pattern, candlestick charts, Shoppers Drug Mart, Technical Analysis on February 16, 2011 by Trader.